Episode 44 is here and the TORT boys take a deep dive into Karate Kid Part 3...well, as deep as we can before we are consuming by the stink pile crap which are these movies. Comics are discussed as well and we'll inform you how to get and play Dreamcast games. Plus, opinions that will make you unfollow us on Twitter(naturally). And of course, more, because why spoil the entire show in the description? Enjoy! 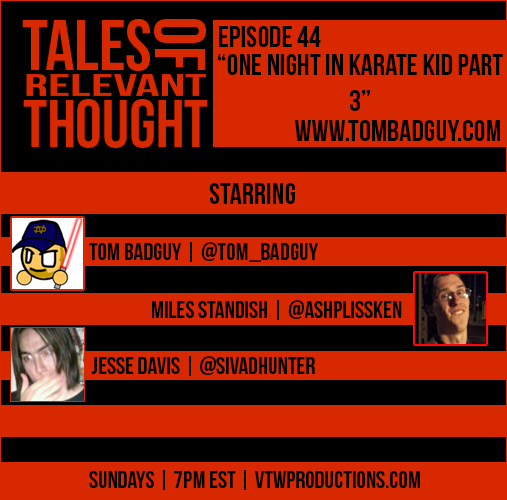 Make sure you tune in tonight for a new TORT ep as we uncover The Next Karate Kid. Could Hilary Swank's role outshine Ralph Macchio's? Also, ESO talk! Don't miss it tonight at 7pm EST!